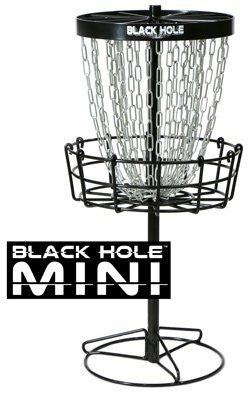 26" height Mini Disc Basket with Black Hole style and engineering. Seamless Matte Black color. Electrophoresced first stage followed with tough powder coated outer shell for extra durability and protection. Double chain tiered design with 24 mini scale strands. 12 outer and 12 inner chains with Black Hole equidistant orientation for zero weak pockets. Banded 11.5" diameter header. 12.5" diameter cage. Standard Black Hole load distributed base. All metal construction, all joints welded. Assembles or disassembles in under 1 minute. Threaded tension connections for a sturdy assembly.